Girls worldwide are less likely to complete their education than boys. There are several reasons for this; however millions of girls living in developing countries like Uganda skip up to 20% of the school year simply because they cannot afford to buy mainstream sanitary products when they menstruate. This has enormous consequences on girls' education and academic potential. 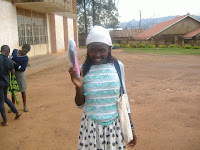 Girls often use dry leaves or newspaper instead of sanitary towels, which are unhygienic and can cause infection. 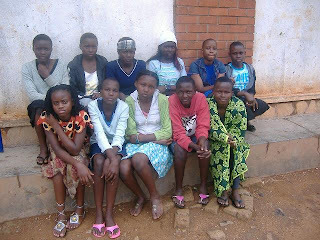 Kids Club Kampala is working with vulnerable girls in the slums of Kampala, by supporting their education, allowing them a safe space to discuss ideas, ask difficult questions, and receive emotional support, and through supporting their basic needs. We have been helping many girls to stay in school by providing them with sanitary pads; however these are costly to keep purchasing, and not sustainable. This October, we were lucky enough to partner with AFRIpads. 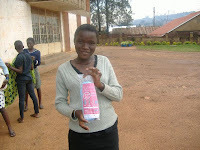 AFRIpads makes reusable, hygienic, sustainable sanitary pads for girls in Uganda. Using these pads not only enhances girls’ health, it also enables them to continue work and school during their period, thereby improving their future progress and development. AFRIpads came to meet our female volunteers and trained them in how to use the pads and how to discuss issues of menstruation with the girls at their centres. It was a great day and all our volunteers really enjoyed themselves. Since then, our volunteers have been teaching the girls at their centres how to use the pads and talking to them about different issues that they face as teenage girls in Uganda. The girls were so happy to receive the AFRIpads. Thank you to everyone who has supported this programme.